Revel in the luxury of an island escape just off the coast of Abu Dhabi. Choose from our Abu Dhabi luxury resorts to explore wildlife reserve, savannah, beach, mangroves and the Arabian Gulf surrounding. Desert Islands is 8 km off the coast of Jebel Dhanna (two hours' drive from downtown Abu Dhabi), accessible by complimentary water taxi or private seaplane. Follow the E11 highway directly from Abu Dhabi or Dubai in the direction of Tarif and Mirfa. Passing Tarif, Mirfa, Baynoona and Al Ruwais, take exit 113 marked Sir Bani Yas Island, and at the roundabout take the Sir Bani Yas exit. At the next roundabout, take the second exit. 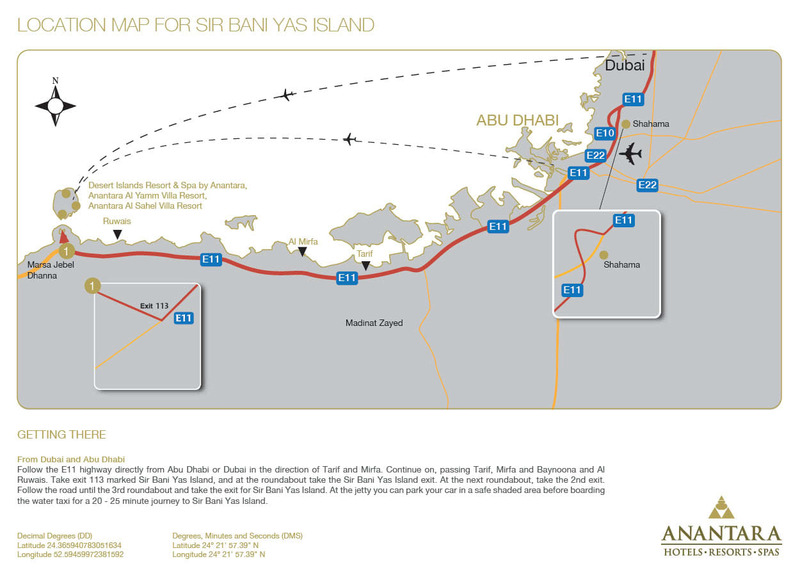 Follow the road until the third roundabout and take the exit for Sir Bani Yas and Jebel Dhanna Jetty. At the fourth roundabout, take the first exit marked Sir Bani Yas Island. At the jetty, you can park your car in a safe, covered area before boarding the complimentary water taxi. Our luxury limousine service transports guests from Abu Dhabi or Dubai to Jebel Dhana Jetty. From there, guests board the water taxi for Sir Bani Yas Island. Please contact +971 (0) 2 801 5400 to book your journey. A 48-hour advance booking is required. We offer a complimentary 15- to 20-minute water taxi transfer for all our guests to and from the island. This service operates 4-5 times daily and must be booked 24 hours in advance. Please note that the water taxi transfer schedule is subject to weather conditions and coastguard approval. Please note that these flight services are operated and managed by a third party, and that the operator’s terms and conditions apply.